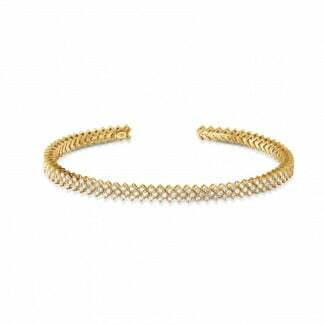 The diamond bracelets mounted in yellow gold are extraordinary jewels that you can wear for any occasion. Discover our collection of high-quality yellow golden diamond bracelets, offered at an unbeatable price. Enjoy a luxurious creation, whereby yellow gold is subtly combined with a magnificent pear shaped, princess-shaped, oval-shaped diamond or just in its classical form. 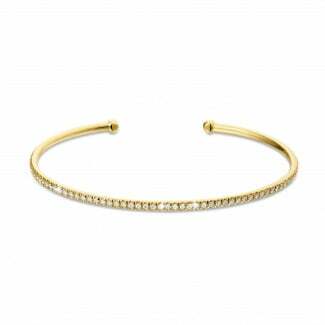 In this selection of yellow golden bracelets, you can undoubtedly find the bracelet you've always dreamed of. Our collection gives you an extensive range of timeless jewellery with a modern style. BAUNAT also offers diamond bracelets in platinum, white and red gold. Jewels that are manufactured in all its perfection, thanks to the competence of our experienced goldsmiths.